THE BRAIN CAN CHANGE ITSELF. It is a plastic, living organ that can actually change its own structure and function, even into old age. 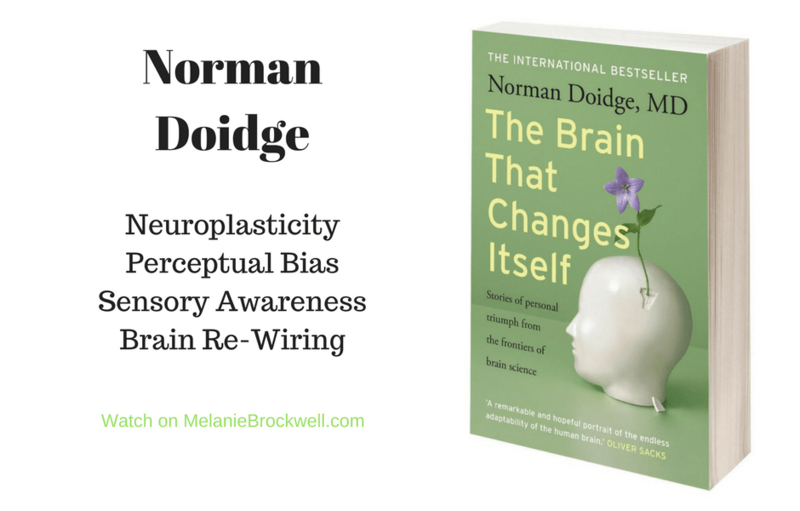 Arguably the most important breakthrough in neuroscience since scientists first sketched out the brain’s basic anatomy, this revolutionary discovery, called neuroplasticity, promises to overthrow the centuries-old notion that the brain is fixed and unchanging. We see a woman born with half a brain that rewired itself to work as a whole, a woman labeled retarded who cured her deficits with brain exercises and now cures those of others, blind people learning to see, learning disorders cured, IQs raised, aging brains rejuvenated, painful phantom limbs erased, stroke patients recovering their faculties, children with cerebral palsy learning to move more gracefully, entrenched depression and anxiety disappearing, and lifelong character traits altered. Doidge takes us into terrain that might seem fantastic. We learn that our thoughts can switch our genes on and off, altering our brain anatomy. Scientists have developed machines that can follow these physical changes in order to read people’s thoughts, allowing the paralyzed to control computers and electronics just by thinking. We learn how people of average intelligence can, with brain exercises, improve their cognition and perception in order to become savant calculators, develop muscle strength, or learn to play a musical instrument, simply by imagining doing so. Using personal stories from the heart of this neuroplasticity revolution, Dr. Doidge explores the profound implications of the changing brain for understanding the mysteries of love, sexual attraction, taste, culture and education in an immensely moving, inspiring book that will permanently alter the way we look at human possibility and human nature. This book is about the revolutionary discovery that the human brain can change itself, as told through the stories of the scientists, doctors, and patients who have together brought about these astonishing transformations. Without operations or medications, they have made use of the brain’s hitherto unknown ability to change. Some were patients who had what were thought to be incurable brain problems; others were people without specific problems who simply wanted to improve the functioning of their brains or preserve them as they aged. For four hundred years this venture would have been inconceivable because mainstream medicine and science believed that brain anatomy was fixed. The common wisdom was that after childhood the brain changed only when it began the long process of decline; that when brain cells failed to develop properly, or were injured, or died, they could not be replaced. Nor could the brain ever alter its structure and find a new way to function if part of it was damaged. The theory of the unchanging brain decreed that people who were born with brain or mental limitations, or who sustained brain damage, would be limited or damaged for life. Scientists who wondered if the healthy brain might be improved or preserved through activity or mental exercise were told not to waste their time.